I was an exchange teacher in England in the 1980’s. Part of my duties included chaperoning field trip of various grades to geographical and historical sites. On a mild and clear day in April, I helped out taking a group of fifth graders to a famous historical National Trust property in Dorset. The path around the lake was lined with what seemed like an uncountable variety of trees, flowering scrubs and hedges. Out class was not there as a tourist group; instead we had volunteered to help in a restoration project. The chief landscaper and groundskeeper was our guide and instructor for the day. About an hour after our arrival, as we were getting started on our part of the project, several sheep appeared from behind the hedge row. They were after the succulent grass that made up the spacious lawns around the lake. The kids went wild with joy. The boys chased a few around the yard. The groundskeeper gently told us to treat the sheep with tenderness and not to get them too excited. But, he added with a gleam in his eye, you can chase them some when they come out but try to usher them back to the hedges and woods. The small flock wandered off and we went back to work. Another hour passed and a few more sheep emerged from the trees. This time the boys took the order to ‘usher them back’ quite literally and a wild chase ensued. One sheep became cornered against the lake water…the boys closed in hoping to grab it and carry it back off the grass. The sheep began to move about in a highly aggravated state, like it had a strain of Mad Sheep Syndrome. Then, in full view of the entire class, chaperones and National Trust gardener, the sheep fell over on it’s side…and died. The girls began wailing. The boys stared in shock (and hung their heads, sheepishly). All those present were struck dumb by what we had just seen. If the boy who made the final lunge at the animal were a dog and not on National Trust property a farmer would have produced a rifle and shot the child. 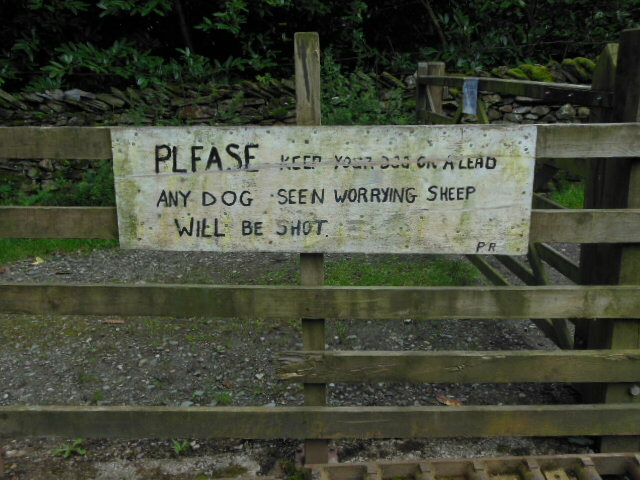 Such were the laws of dogs, sheep and rural England. I’ve often wondered, these many years later, if the boys still count sheep to fall asleep. Do these kids (now adults) take longer to doze off if there is a sheep missing from the ones they’ve been counting? A vow I made that afternoon, and can honestly repeat to you now, is that I will NEVER worry any animal, especially a sheep, to death.